Tracking user's eye fixation direction is crucial to virtual reality (VR): it eases user's interaction with the virtual scene and enables intelligent rendering to improve user's visual experiences and save system energy. Existing techniques commonly rely on cameras and active infrared emitters, making them too expensive and power-hungry for VR headsets (especially mobile VR headsets). 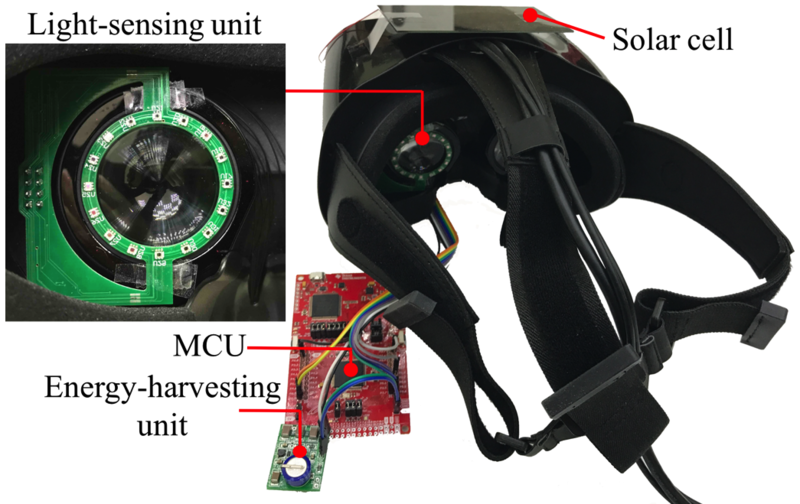 We present LiGaze, a low-cost, low-power approach to gaze tracking tailored to VR. It relies on a few low-cost photodiodes, eliminating the need for cameras and active infrared emitters. Reusing light emitted from the VR screen, LiGaze leverages photodiodes around a VR lens to measure reflected screen light in different directions. It then infers gaze direction by exploiting pupil's light absorption property. The core of LiGaze is to deal with screen light dynamics and extract changes in reflected light related to pupil movement. LiGaze infers a 3D gaze vector on the fly using a lightweight regression algorithm. We design and fabricate a LiGaze prototype using off-the-shelf photodiodes. Our comparison to a commercial VR eye tracker (FOVE) shows that LiGaze achieves 6.3° and 10.1° mean within-user and cross-user accuracy. Its sensing and computation consume 791 μW in total and thus can be completely powered by a credit-card sized solar cell harvesting energy from indoor lighting. LiGaze's simplicity and ultra-low power make it applicable in a wide range of VR headsets to better unleash VR’s potential. We sincerely thank our shepherd Fred Jiang and the reviewers for their insightful comments. Special thanks to Emmanuel Akosah '19 for the help on the user study and development of demo applications. We particularly thank Jenny Hyun Ji Seong and Anne Muller from DALI lab for help in the demo video production. This work is supported in part by the National Science Foundation under grant CNS-1421528. Any opinions, findings, and conclusions or recommendations expressed in this material are those of the authors and do not necessarily reflect those of the funding agencies or others.